This splendid display was seen last night in Sirkka, Finland. The photographer, Timo Veijalainen, tells the display lasted for about an hour after he noticed it and that the temperature was close to -10° C. Sirkka is a settlement right next to Levi ski center, from which snow guns this must have originated. Click above to see more images on the photographer's site and check also what Les Cowley says about the halos ( 1 ). 46° contact arc was suggested theoretically in 1980 by Robert Greenler. 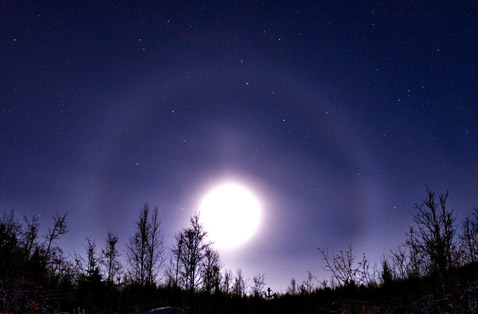 Halo enthusiast have since kept the 46° contact arc in mind, but it was not until 2006 that first photos surfaced when a well developed diamond dust display was seen in Muonio, Finland ( 1 ). Second, slightly less obvious case was photographed in spotlight beam last winter in Riihimäki, Finland ( 2 ). 46° contact arc is formed by Lowitz-oriented crystals and it divides in three components. One of the components comes from raypaths that pass through prism face that is parallel to the Lowitz axis. This component is found straight above and below the sun. 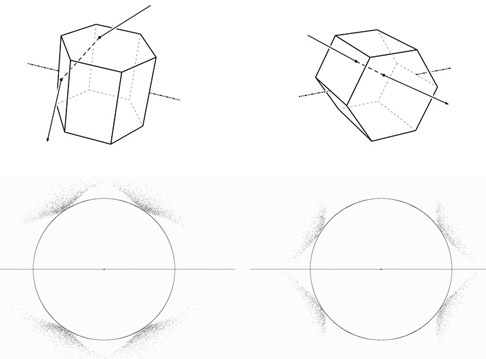 In spinning crystals light ray can enter both prism and basal face (1-3 / 3-1 type). Two other components (shown above for 0° sun elevation) are formed by raypaths that pass through prism face that is at an oblique angle to the Lowitz axis. They are distinguished by the ray either entering (4-1 type) or exiting (1-4 type) this face. These arcs are not in the solar vertical and their position changes with sun elevation. See simulations (Jukka Ruoskanen's software) where 46° contact arc components are shown from spinning crystals for different sun elevations ( 3 - 4 ). Normally, though, halos from Lowitz orientation are not indicating spinning-type orientation distribution. Rather, we will see 46° contact arc from either plate-Lowitz or Parry-Lowitz orientation ( 5 ). On most sun elevations 46° contact arc components conform deceptively the curvature of the 46° halo. 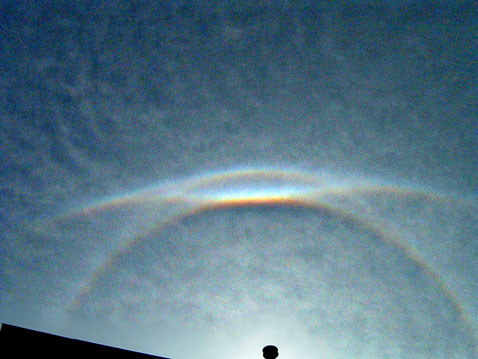 Circumzenith arc also can overlap upper components. Because of the delicate form of 46° contact arc, it may be very difficult to observe in high clouds. Chances are certainly better in uniform diamond dust. 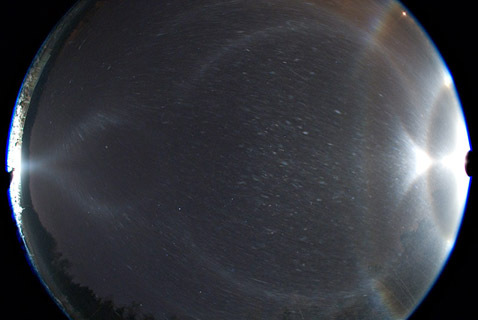 Circular halos on snow surface are common sights, but on ice surface halos are seen much less often. 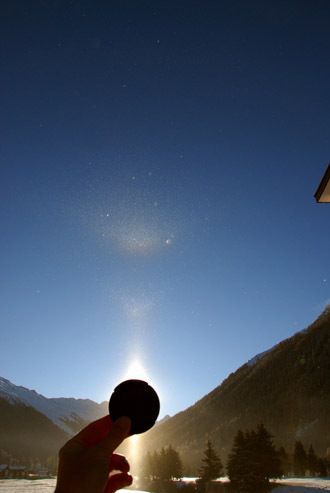 When ice surface halos do show up, they are made by oriented crystals and can be rather bright. Such was the case this morning in Oulu, Finland, where subparhelia was photographed by Karin Parker on lake Pyykösjärvi ( 1 ). 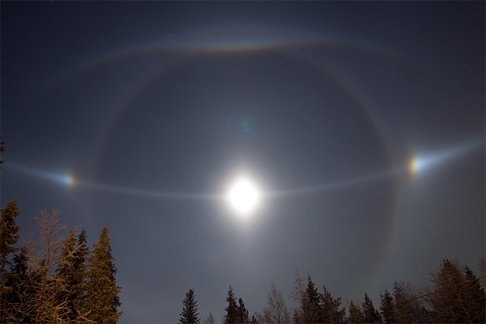 Once in similar situation also sub-120° parhelion and subanthelion was seen ( 2 ). 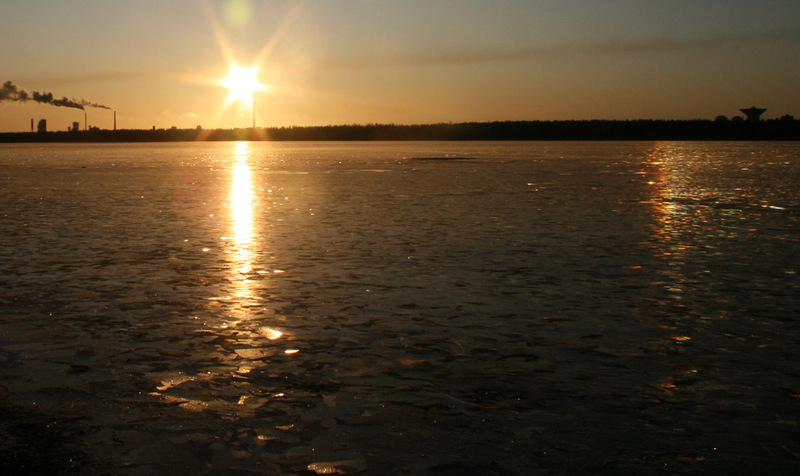 If ice is thick enough, it is good take a little walk and and look around for these less conspicuous halos as well. Winter's first display in a spotlight beam was captured in the weekend by Jukka Ruoskanen. Click on the image to see the rest of his photos. This recently seen display, although not a bright one, highlights an important issue. There is the Moilanen arc but no plate arcs. 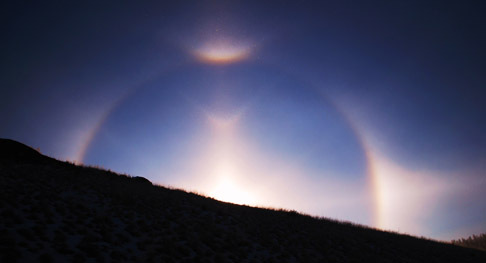 "Not the slightest hint for circumzenith arc or sundogs. Absolutely nothing", writes Bertram Radelow, who photographed the display in Davos, Swizerland (air temp. -5°C, sun elevation 9°). Thus, the crystal wedge angle that makes the Moilanen arc does not seem to occur in plate crystals. Column oriented crystals seem to also be out of question, because in simulations for one thing this orientation would make also lower Moilanen arc, which has not been observed yet. And if we assume that some of the columns or plates take Parry orientation, it makes sense to conclude that Parry crystals are neither the answer. So, it feels like Moilanen arc crystal makes no other halos at all, and finding the crystals from crystal samples should be easy. But we have looked at many samples already and there has never been anything peculiar occuring in great enought numbers to name as a suspect. It is also interesting that Moilanen arc has not been seen alone yet, which could imply that its crystal after all makes other halos. It is mysterious, but one day somebody is bound to take those desicive photos. Displays that have common halos only from one crystal orientation (such as here) are of course the best ones to look for the crystal. 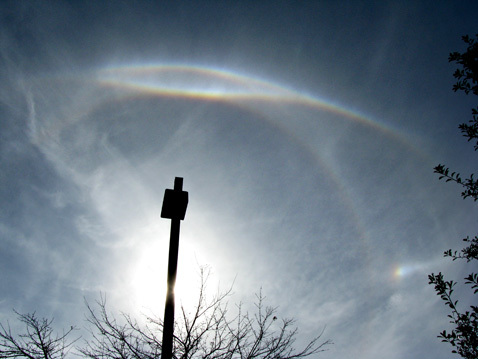 Glenn Wolford photographed this display on November 9 in Syracuse, N.Y., U.S.A. 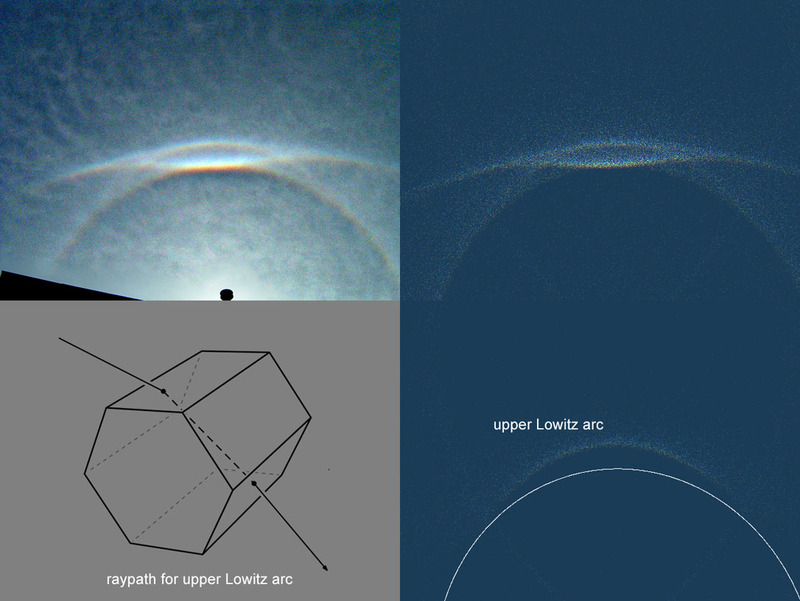 The noteworthy feature is the upper Lowitz arc from Parry-Lowitz orientation. Click on the photo for simulation. Lowitz crystal tilts in the simulation are 13 degrees and sun elevation 30 degrees. Simulations and crystal figures from Jukka Ruoskanen's software. See also another photo ( 1 ).